1. 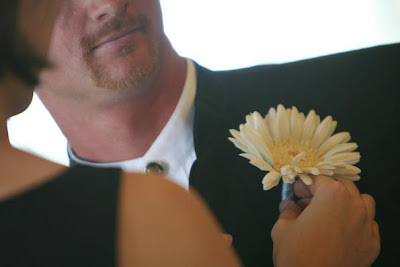 Make sure you have a boutonnière and at least one pin (I prefer two). 2. Pins go in your mouth, holding them with your lips. Try not to stab yourself. 3. 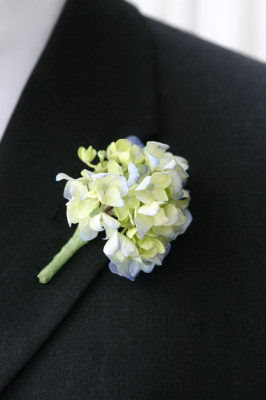 Place the flower on the man's left lapel so the area where the stem and bloom meet covers the buttonhole in the jacket. Angle it slightly outward so it gently follows the shape of the lapel's edge. 4. Make a flower hot dog. Pick up the lapel's edge and roll it towards the man's right side. Standing opposite the gentleman, you'll fold it from the right to the left, covering the flower. 5. Holding the fabric tight against the flower, stick the pin in straight towards the gentleman, aiming towards the top part of the stem. 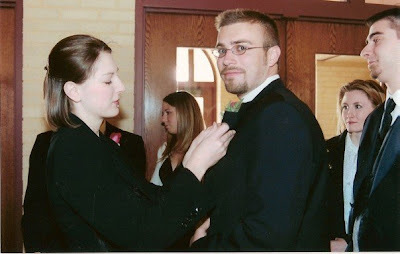 Make sure you get a good chunk of stem but not too much so that the pin shows on the front side of the lapel. "Look ma - no pins!" 6. Repeat #5 with your second pin, this time closer to the bottom of the stem. Try not to stab your victim wearer. Tell dad to smile for the photograph: 7. Ask the wearer if it feels secure. Tug on the stem a little to see if it budges. 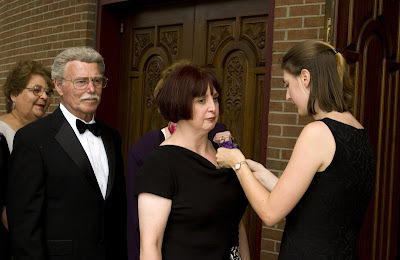 If it moves just a little, try pinning it again until it's stuck on the lapel for good. 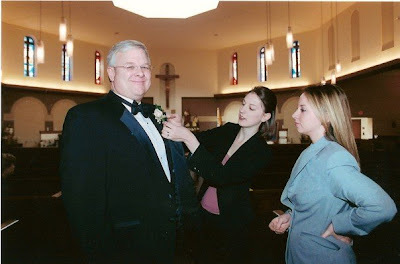 As a reminder, the following folks should receive a boutonnière: Groom, Best Men, Groomsmen, Fathers, Grandfathers, Ushers, Readers, and other important gentlemen who have a significant a role in your wedding. Don't be offended if your musician doesn't want a flower though - my dad is a trumpeter who plays a few weddings a month. If the flower is scented at all it really irritates him to breathe in the fragrance while he's playing, so he usually tells the bride in advance that he prefers not to wear one. This is the best tutorial I've seen in a long time. Wow Laura - this is great. I am asked to do this a lot - and I always decline...now I suppose if it is really needed I might be able to pull it off!! Your tutorial is on Blue Orchid Designs! Wow it's looking very cute and pretty.....! !